Visions of sand dunes, tumbleweeds, and dry washes might come to mind when you think of the Arizona desert, and the terrain can indeed be brown and sparse. But springtime brings color to the desert. After the winter rains, the desert comes alive with wildflowers; they're bright, beautiful, and in some years, breathtakingly abundant. Wildflowers generally bloom most prolifically in the Sonoran desert near Phoenix from mid-March to late April. The appearance of wildflowers depends on the amount of rain that fell during the previous winter and the timing of the moisture, so check the wildflower reports to find the best viewing location and predicted bloom in any particular year. The flowers can appear as early as February and sometimes last into June. About once every decade the desert experiences a "super bloom," with such a profusion of flowers it literally transforms the landscape. The desert can experience another notable wildflower bloom following sporadic summer rains, though the heat and more localized moisture mean you rarely find widespread color but rather random pockets of flowers in July and August. Cacti, with their ability to store water, bloom even in dry years, so you can usually find something flowering in the Sonoran desert from April through September. Mid-morning typically offers the best viewing time, after most blooms open but before they begin to wilt in the midday heat. Peak viewing lasts only for a couple of weeks at the most. Poppies, lupines, and owl clover contribute shades of yellow, blue, and purple to the sandy ground. Prickly pear cacti turn out yellow, red, pink, and white blooms, while the stately saguaro, a symbol of the Sonoran desert, offers a short-lived white bloom. Many last only a day. Some trees and shrubs bloom as well, such as the desert ironwood tree, adding more colorful highlights to the beige backdrop. Several parks, preserves, and recreation areas in the Phoenix region provide maintained trails for viewing wildflowers. They range in difficulty from easy to challenging. When hiking, stick to established trails, wear sturdy shoes, and watch out for rattlesnakes, which come out to bask in the springtime sunshine. It's best to hike in pairs or small groups and be sure to let someone who won't be joining you know your intended destination. Carry plenty of water, wear sunscreen, and keep pets leashed at all times. Also, don't forget to find a patch of shade periodically for a few minutes of respite from the sun. 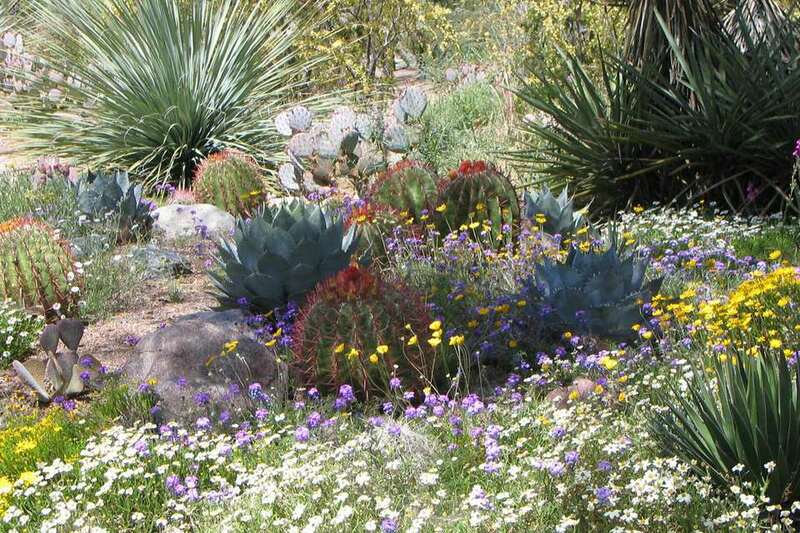 The Boyce Thompson Arboretum State Park, the state's first and largest botanical garden founded in the 1920s in Superior, Arizona, east of Phoenix, showcases the beauty of the desert environment. Even during a dry year, you can visit the Arboretum for a dose of desert color. Volunteers conduct guided tours of the grounds, which include a 3-acre cacti garden, where you can discover the diversity and beauty of this flowering desert plant.